For use in breakout spaces, classrooms and and FLL competition space. Full size LEGO Mindstorms FLL table. Developed with LEGO Education, these project tables are designed specifically for First Lego League activities and competitions. 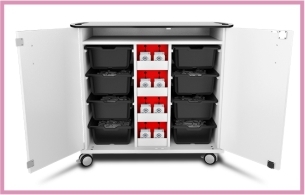 With a raised edge to stop parts falling off, and a flip top and lockable castors for mobility.